Possible alien portal at Baum and Negley. 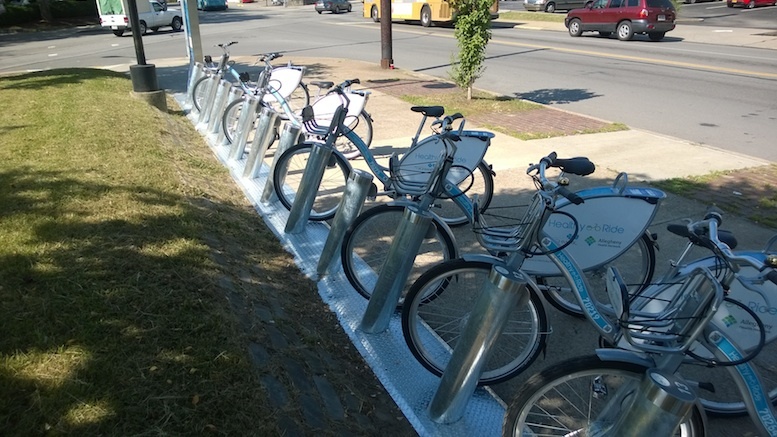 People across Pittsburgh’s Downtown, East End, and pockets of the Northside and Southside were greatly confused this week to see unfamiliar structures housing peculiar two-wheeled contraptions on sidewalks everywhere. The extent of their distress came to light when the Warhol Museum reported being deluged with calls complaining that their latest outdoor art installation was ‘total crap’ and should be immediately removed. City Officials rushed out a press release this morning explaining that these are part of a new transport initiative called Healthy Ride which has already taken hold in many places across the nation, albeit in cities where local residents already knew what bicycles were. Mayor Peduto admitted he botched this one. He urged people to give the program a chance and to refrain from damaging the bicycles, though some have already been destroyed by wary Pittsburghers acting out of a primal fear of the unknown. Others responded by decorating the other-worldly structures with flowers and holding meditative vigils, presuming them to be the forerunner of some higher intelligence preparing to reveal itself. Some residents did attempt to wrap their minds around this new mode of transportation, though they expressed concern about the safety aspect, as they could not locate the seat belts, and also wanted assurances that the airbags, wherever they were concealed, were not subject to the recent Takata recall. A man from Friendship was particularly interested in how the velocipedes were powered. He was informed that they do not use gas of any kind. Those wishing to try out the bicycles, or ‘bikes’ as they are sometimes called, are recommended to seek out individuals familiar with their operation for guidance, such as someone who has ever lived anywhere else, or very old people who know what a penny-farthing is. 1 Comment on "Pittsburghers Freak Out As Strange Two-Wheeled Contraptions Appear All Over City"
I ride a bike to get around here in N.H. And I am almost 70.it,s not easy and drivers don’t alwayswatch out for people on bikes. I drove for a living before I retired and won’t drive again. I hope more people will do the same!